It is fabulous. 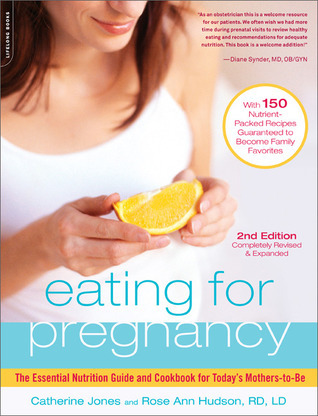 The first part of the book walks you through everything from healthy weight gain, to types of foods that are rich in certain vitamins and minerals essential for you and baby. The authors even provide specific brands, of bread for example, which are the most well-balanced (100% of your daily fiber, high in folic acid, etc.). Another thing I love is that they explain exactly what certain foods contribute to healthy growth and development for baby. The next part of the book lays out a week's worth of sample meal plans-full of variety-and all are well-balanced. Next comes the recipes! At the top of each recipe, there's a statement about the health benefits of the recipe for you and baby. Some recipes are more involved, to be created on a weekend, but many of them are quick, easy and delicious. This week I started my summer job, so I had to be prepared with breakfast, lunch, and snacks to take with me. Last night I made their chicken salad recipe, which, while a semi-common lunch recipe, this one is packed with ingredients for baby like fresh herbs, red bell pepper, sliced almonds, and dried apricot. I just finished my sandwich for lunch today and was completely satisfied. Crunchy, sweet, herbaceous, meaty, salty, enough said. When eaten between two slices of hearty, whole-grain bread, this sandwich will keep baby and me full for awhile! I coupled this sandwich with hummus (there's a recipe for home-made hummus in the book, but I bought mine:)) and carrots, and a small spinach salad with light Greek dressing. As you can see, dairy is missing from this list, so I will have a yogurt for snack later! For me, visually seeing a daily meal layout in this book really helped me think about planning intentional snack and meal choices, ensuring that by the end of the day, baby and I have gotten exactly what we need. I hope to post more as I work through the meal plans and recipes. On a final note, the authors took great care in creating meals that the whole family will love and benefit from, not just mom and baby. I've been absent-lost in the whirlwind that is the first trimester. While I have been extremely blessed to have made it through without one bout of morning sickness, my eating habits have changed, needless to say. I have been doing loads of research about healthy, safe foods to eat during pregnancy, and I have done my best to eat healthy whenever my brain lets me. My biggest concern was with getting an adequate serving of daily vegetables, since my brain can no longer bare the thought of consuming them to the degree I did before pregnancy. And did I mention that I have had zero desire to cook? Hmm. My food world has definitely been rocked. So here's my ammended eating plan. It does contain some carbs, because that is basically all I've felt like, but I have stayed within my healthy weight gain range, so my body must be processing things properly. This has been my downfall. If I'm being open and honest with the world, dinners have ranged from Chiak-fil-a to build-your-own gormet sandwiches from a local market (for Dallasites: Eatzi's). Gone are the days of a carb-free dinner full of home-cooked veggies and meats...for now anyway. Spread cream cheese in layer at bottom of your serving tray. Top with caramel and sprinkle with chocolate. Cut apples (green really are the best for this because they're so sour) and arrange them around the dip. The original recipe ads 2 tbsp of powdered sugar to cream cheese before spreading, and it includes crushed Heath bar as an additional topping. Other ideas I had for toppings: chopped walnuts or peanuts, flaked coconut, butterscotch or white chocolate chips, yum! This recipe is adapted from one I found on Southern Living's recipe site after perusing Pinterest. *My modification: half mild cheddar, half smoked cheddar...wowzers. *And: Grate your own cheese...bagged kind is too dry for this recipe. Toast nuts by putting them in a dry pan (meaning no oil or butter) over medium heat until they become fragrant. Note: Nuts can burn quickly so tune into your nose. When you can smell 'em, they're toasted. Cool for a bit (otherwise they'll melt the cheese). Stir together mayonnaise, diced pimiento, chopped pickled jalapeño peppers, liquid from sweet-hot pickled jalapeño pepper slices, and toasted pecans. Stir in cheese until well blended. Serve with red bell pepper strips, cucumbers, carrots, zucchini strips-whatever you love! I typically buy the same vegetables at the grocery store every Sunday and figure out what protein or leftover I'll serve them with later. Running in the store for some ground turkey after work is easier than strict meal planning for me. Tonight's dinner was particularly satisfying (and I remembered to photograph it)! I had everything but the burger meat and cheese, so I grabbed that on the way home from work. Medium high heat, 7 minutes first side, flip, 4 minutes, top with cheese to melt for a minute. 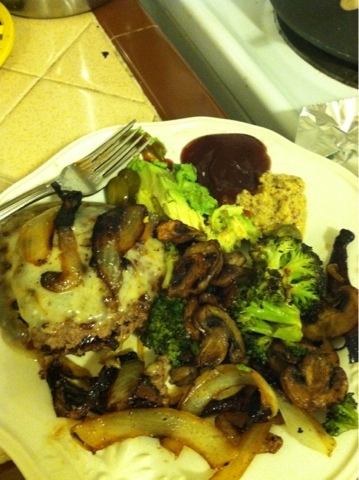 Caramelized onions and roasted veggies in another post. Other additions you'll see in the picture. Grain mustard and BBQ sauce (my favorite burger condiment combo), and my new obsession: hot and sweet jalapeños. These are found with all of the other pickled items and I think they're technically a "deli sandwich" topping...amazing! Frozen chicken breasts kind of ick me out. But, did you know that if you stumble upon a crockpot recipe that calls for chicken breasts, you can use frozen ones? Benefits: you can keep them on hand for a long time and they are often cheaper than fresh. I'm sure many of you have had buffalo chicken dip (a new tailgating craze dish). This is similar. But a meal, not a dip. Shredded lettuce or romaine lettuce to make cups, shredded cheddar cheese, sour cream, avocado, blue cheese crumbles, corn, black beans, chopped celery...the possibilities are endless. Throw chicken, about half of the jar of hot sauce, and the ranch packet in the Crock-Pot and let it do it's thing for 6ish hours. Then shred the chicken with 2 forks, give it a taste-er-oo, and perhaps add a bit more sauce. I find that chicken soaks up sauces in a slow cooker super well, which sometimes means you need to add more at the end to keep everything scrumptious and moist (I hate that word. Please, someone come up with a synonym that still conveys the same meaning!). If you add more sauce, turn the pot to "warm" and let it sit for a little longer to allow the chicken to soak up Frank's goodness. Enjoy a scoop of chicken on top of lettuce and topped with whatever your heart desires. I don't like being lied to. I've read several blog posts where people claim "spaghetti squash tastes exactly like pasta." Well, it doesn't. In fact, the only thing the two do have in common, is the spaghetti-like consistency of the squash after cooking...but it's still delicious and a great side-dish for fall! This recipe is a modified version of Emeril's dish I found on foodnetwork.com. Directions: Preheat oven to 375 degrees. Using a sharp knife, cut squash in half lengthwise (don't feel bad if this is really difficult...because it is...just kind of shove your knife into the middle and try to cut it in half from the middle on both sides...). Put squash in a baking dish, cut-side down. Fill dish with water so that is comes about 1/2 inch up the side of the dish. Cover with foil and bake for 45 minutes, until squash is easily pierced with knife (though the skin). Turn squash over and cover/cook again for 15 minutes, until it's tender. Remove from oven, uncover, and let it cool until you can handle it (but don't wait too long or butter won't melt as nicely). Use a spoon and scrape out seeds and stringy stuff. Then use a fork to pull the flesh (gross word) away from peel. It should peel off and look like spaghetti (hence the name:)). Put sqush into a mixing bowl, and add your butter. Mix so that the butter melts and coats squash. Then shake parmesan cheese all over and mix again. Taste and add some salt and pepper to taste. You will L-O-V-E this! Variations: Add your favorite pasta sauce to make it even more pasta-like. Or try skipping the cheese and add fresh chopped hebs (this is how Emeril does it): basil, chives, sage, parsley. Serve alongside your favorite protein for a fab fall meal! Peel cucumbers, cut them in half lengthwise, use a spoon to scrape out the seeds, and chop them up. Put the chopped cucumber in a bowl and sprinkle with salt which will draw out some of the water (an important step so your sauce isn't too watery). Go put a load of laundry in, or paint your nails, and return in 30 minutes to finish the dish. After 30 minutes, dump cucumbers onto a dish or paper towel and pat dry. Serve atop chicken and thinly-sliced white onions. This would go well with some roasted vegetables, perhaps green beans with lemon and almonds...? 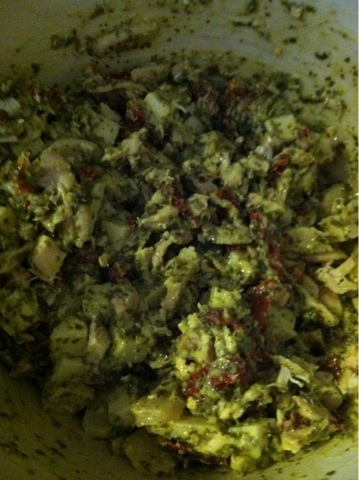 I believe I'm addicted to pesto...I find ways to put it in anything that makes sense...try this warm pesto chicken salad. It won't disappoint. Remove chicken from bone and shred or chop. Combine chicken, mayo, and pesto in a bowl. Add water chestnuts, sundried tomatoes, and mozzerella. Serve this with a salad, or to continue the Italian theme, see my "Parmesan Speghetti Squash" post. With the school year starting back up, things have been super busy for me at home. Rotisserie chickens from the store have provided me a much needed time-saver for weeknight dinners. I have a few recipes to share. Leave me a comment if you are wanting a recipe in another genre, and I'll experiment! Take meat off chicken and shred it up with your fingers or a fork. Heat oil on medium. Add onions and garlic and cook until onions are transparent. Add crushed tomatoes, chopped peppers, sauce from can of peppers, tomato sauce, chicken bouillon granules, and shredded chicken. Heat until mixture thickens. **Note: My original recipe says to put the crushed tomatoes, peppers, sauce, tomato sauce and bouillon in a blender or food processor and process until smooth, but I don't really see a need for that step. Just makes sure you give your mixture enough heat time so everything cooks together, and you'll be fine! Serve Tinga atop shredded lettuce and top with your fixin's. M-m-m-m.